My folks come over to the UK from Hong Kong every other year on holiday, so for much of July and August, I’ve had them staying with me. For a couple of weeks, I also had two sisters and their kids (3) stopping by too, so yes, it was a very full and noisy house, but it was great to spend quality time with them all. I took some time off work and we went on a few day trips, one of them being to Wales. 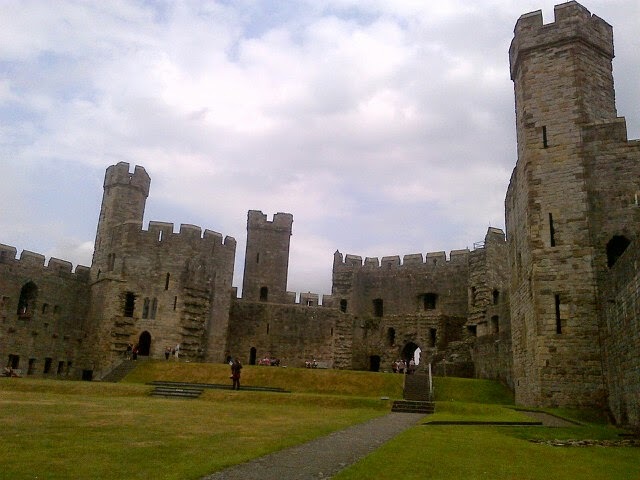 We visited Caernarfon Castle, which was most impressive and in beautiful condition. We climbed to the top of the tower on the right – lots of steps! Other days were spent enjoying the rare Manchester sunshine, barbecues, football kick-abouts and water-gun fights in the garden with the kids! My folks are happily retired and are financially secure. Both retired early, particularly my Mum – I’ll do a post about that at some point. I did notice this time round that they weren’t particularly frugal, eg I was forever switching off lights, unplugging devices, turning off the TV, turning off running taps. Perhaps they’ve always been like this and I just didn’t notice before. Also, they loved to go food shopping, but things didn’t always get eaten on time (or it was something new that they didn’t like) so ended up being thrown away, including to my horror, a piece of sirloin steak, hidden in the fridge under a load of other food so it went out of date! And no, I never said a thing to them (ok, so I had a little moan about the steak!) as they were here on their holiday. Plus, I’ve been coming home from work to my Mum’s yummy home cooking – it’s been great, aside from my expanding waistline! I’ve definitely put on a few pounds since they’ve been here! My folks flew home today, which is just as well, as the weather has turned a little too chilly for their liking and they were worried that the volcano in Iceland could blow, which could cause flight disruption. I’ve been left with a big pile of laundry to sort out but also, a fridge and freezer full of food, so all I need to buy this weekend from the supermarket is beer! Anyway, to readers in the UK, hope you have a nice bank holiday weekend! Me, I’m preparing for a wet time at Leeds Festival! This entry was posted in Expenses, Family by weenie. Bookmark the permalink. Hi Cerridwen, thanks, I did have a great time and no rain! Have fun at the Leeds Festival. I use to love going to music festivals but I haven't been to one in ages. Hope you haven't got too wet! Hi Mrs FF, I've only been to 5 festivals, first one was only in 2006 so I started late in life! It didn't rain when we were there but the ground was very muddy! Hurray for wellies! Hope you had a wicked time at Leeds! I used to live about 2 miles from the Reading Festival site and have been for the past 10 years! Didnt get to go this year due to work commitments unfortunately 🙁 I'm thinking maybe I should travel up and try Leeds one year? Hi ERG, yep had a great time thanks – the rain threatened but didn't materialise. I've never been to Reading before but I guess it's the same as Leeds? Anyway, I hope to be able to go again next year, but so far, I've been unable to go two years in a row, dependent on work or finances!